Even Reese's PB Cups are Jealous! Warning: This stuff's so good it may make your head explode! Place toasted bread cubes in a 1-quart baking dish sprayed with nonstick spray, and sprinkle chocolate chips evenly on top. 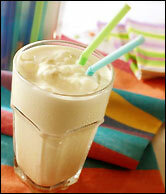 In a blender, combine soymilk, egg substitute, peanut butter and brown sugar. Process at medium speed until smooth. Pour mixture over bread cubes, making sure all the bread cubes are covered. Let stand for 5 minutes. Place dish in the oven, and bake for 45 - 50 minutes (until pudding is firm). Best when served warm. If you like, add some whipped topping before serving. Place all ingredients into a blender and mix until smooth. Enjoy! Serves 1. *Use a chocolate-flavored pudding cup for a Chocolate Peanut Butter Milkshake! Layers of Chocolatey Peanut Butter LOVE! In a bowl, whip Cool Whip and Better 'n PB until well mixed (use room temp PB for easier mixing). Set aside. Warm VitaTop for ten seconds in the microwave and break up into small pieces. In a martini glass or parfait cup, layer ingredients like this: 1/2 VitaTop pieces, 1⁄2 Cool Whip mixture, 1/2 VitaTop pieces, 1⁄2 Cool Whip mixture. Cover; chill at least 1 hour. 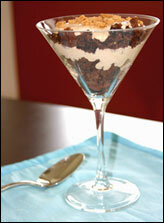 Crumble cookie crisps over parfait before serving. Serves 1. ****HG HEADS UP! You may use regular peanut butter in all of these recipes. Nutritionals will vary accordingly, as regular PB contains around 90 calories and 8g fat per tablespoon and Better 'n Peanut Butter has 50 calories and 1.25g fat per tablespoon. And as usual, feel free to substitute ANY brand name products with your faves; just know that nutritionals may vary!